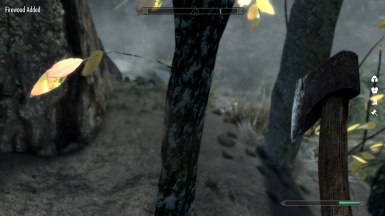 An extension to the Creation Club mod Camping that adds the ability to harvest wood outdoors with an axe, and build your own Camping Kit in a more immersive way. Thanks to TheBearMan for letting me incorporate his mod Axes Chop Wood into my mod, and thanks to SoulMasterII for scripting help on gathering wood. The Creation Club addon Camping is a neat little mod for those looking for a more lightweight way of building a campsite but the downside is having to build the camping supplies at the Forge each time you want to camp. 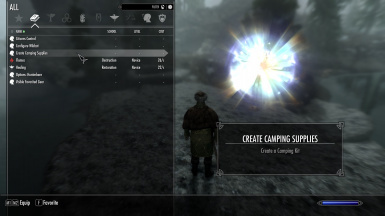 With Camping Extended, the player is instantly granted an ability called Create Camping Supplies that allows them to build the kit wherever they are as long as they have the required resources(3 firewood used, 1 item with keyword VendorItemAnimalHide that is not consumed in the process of making the kit to simulate carrying bedding).